200 HPD: Sports car of the future? An exciting technology concept was unveiled on the 23rd October, 2003 at the Motor sport Industry Association's "Clean Racing Conference." 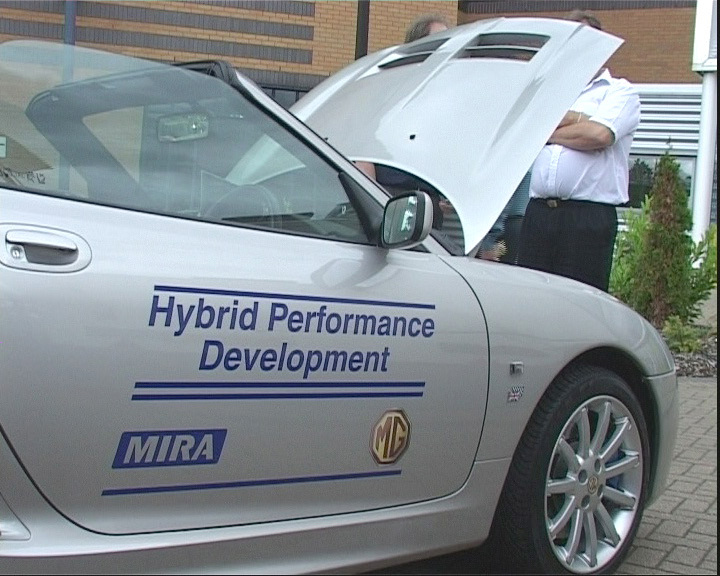 The "Hybrid Performance Development" (HPD) is a petrol/electric powered MG TF featuring a combined output of 200Ps (198 bhp) deployed through its four road wheels. The MG TF derived 200 HPD, was built by MIRA's engineers in consultation with MG Rover, to provide a Hybrid sports car that posses not only both functional and environmental benefits, but also performance potential for motor sport. The development approach combined electric traction with aerodynamic advances that eliminated front and rear lift whilst also reducing drag by 7%, to provide a sports car with a competitive edge and green credentials. The initial development vehicle - the MG TF 200 HPD - reduces the existing 0-60 time from 6.9 to sub-6 seconds, without increasing tailpipe emissions or fuel consumption. Moreover, this car also offers a range of other benefits high on the customer wish list, such as enhanced traction through all wheel drive with a 50/50 weight distribution and the low speed clutchless option of 'City mode'. Working in consultation with MG Rover Group, engineers at MIRA designed and developed a parallel hybrid drivetrain to supplement the existing rear wheel drive 160Ps MG TF, using an electric motor to drive the front wheels. The additional power of the electric motor results in a 25% increase to 200Ps, greatly enhancing the sprint acceleration of the MG TF. The motor, innovatively combined with Continuously Variable Transmission (CVT), extends opportunities for advanced all wheel drive active torque distribution. 200HPD may sound like so much 'alphabeti-spaghetti' or maybe even a new, highly economical model version of a euro-box family car, but in fact it is not anything quite so dull. Not convinced? Well, the fact that it is based on an MGTF should go someway to allaying fears that we at MGFG@UltimateMG are going soft on its core interest of fun sports cars. And what if I told you that the "200" actually specifies the combined power output of two (yes two!) power units in one lightweight sports car in Ps (about 197 bhp in old money)? What if this surplus of power is fed down onto the tarmac via part-time four-wheel drive? Do I have your attention now? 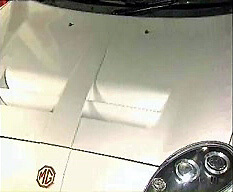 Indeed, this is just one component of what makes the 200HPD a much spicier concept car than the usual motor-show fluff - and represents the culmination of a top-secret collaboration between MG and the Midlands based Motor Industry Research Association Ltd (MIRA) and only made public in November 2003. The "200" part of the name is but one half of the equation - the other is the "HPD", a three-letter abbreviation standing for "Hybrid Performance Development" - which goes some way to make sense of MG's product development director, Rob Oldaker's, comments that the 200HPD represents "responsible performance." One of those two engines mentioned earlier is the conventional, if innovative, 160Ps variable valve control (VVC) 1.8 litre K-series engine - and this power unit delivers drive to the rear wheels in exactly the same way as it does in a more conventional MGTF sports car. What is very different is what is found under the front bonnet. No space saver spare wheel nor aerosol can of 'get me home' foam spray that passes as an 'instant mobility kit' - but rather a more impressive form of instant mobility in the shape of a 40Ps electric motor driving the front wheels. Rather like a number of extremely efficient Japanese hybrid family cars that have appeared in recent years, the TF 200HPD combines a conventional petrol engine with an electric motor: the convenient petrol engine extending the range and performance of the electric power unit and batteries. Thus it is possible for the car to make the best use out of one or other of the engines or even together (hence the 200Ps peak output figure) to suit prevailing road conditions and the need of the driver's right foot. Result: a 200Ps sports car that is capable of in excess of 40mpg, yet can post a 0-60 time in under 6 seconds - we are talking about a seriously quick car here! There are very few cars that will come even close to matching this MG in terms of efficiency and performance. If you are left gasping at this technical tour de force, well, I suggest you have a sit down and have a nice calming cup of tea, because this is not quite the end of the story for this remarkable car. One of the perennial problems associated with vehicles with two engines driving different axles is how to match the performance of both power units in such a way that the two ends of the car don�t end up fighting each other. MG's clever solution is the adoption of a CVT (continuously variable transmission) automated gearbox for the front power train, whilst the petrol engine transfers its power to the road via a more conventional 5-speed manual gearbox. 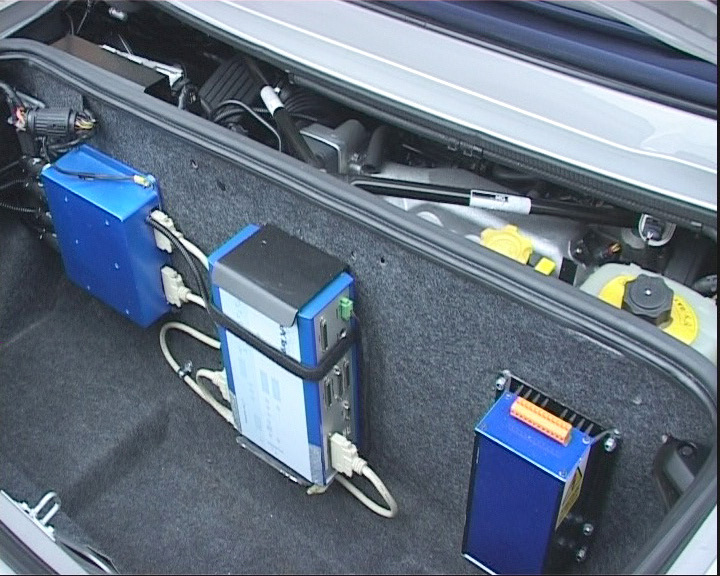 An electronic control unit then enables a smooth integration between the disparate electric and petrol power units - and indeed "active torque distribution" to suit road conditions. But this combination of power unit/ transmissions also represented an unusual opportunity - and thus the 200HPD offers two additional transmission modes that you probably will not be familiar with: 'Hotshift' and 'City mode'. City mode is probably the easiest mode to understand, especially in the context of hybrid, zero-emissions vehicles: in this mode the petrol engine is switched off, and the car is driven by the torquey 40Ps (39bhp) electric motor in fully automatic transmission mode via the front wheels. The result is a comfortable and relaxing city drive in congested traffic conditions - not a facet of sports car driving that you'd necessarily consider essential, but a nice positive side-effect of having the two power-trains, nonetheless. The other mode, 'hotshift' is more interesting for us MG sports car fanatics: it solves one of the problems associated with accelerating through the gears of a manual gearbox. In order to change gear, you need to momentarily step off the loud pedal, drop the clutch and change up a gear - disengaging the lower for the higher gear ratio. Accelerative force from the engine to the road wheels is momentarily interrupted and as a result the car will cease to accelerate during this time (and will even fractionally decelerate because of frictional and other resistive forces acting on the car). 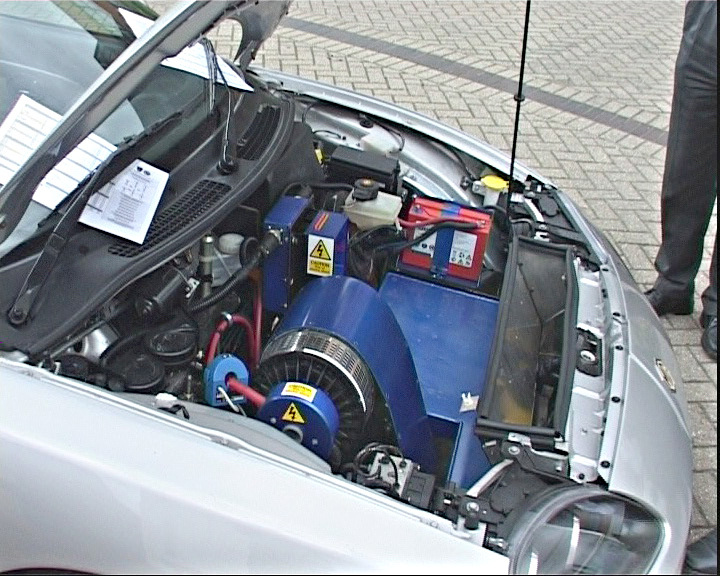 However, with the electric motor engaged, when accelerating and changing gear on the conventional rear transaxle, the electric motor will STILL be providing motive thrust onto the road. Therefore, the car will continue to accelerate even as you disengage the petrol engine to change gear - and hence the term 'hotshift'. This clever combination of power trains is, at least in part, responsible for the 200HPD's scorching 0-60 performance (which requires one gear change along the way). So here we have a sports car with two transmissions, capable of zero-emissions in city thanks to its CVT electric transmission and massive performance through the gears. There is also all wheel drive - which has benefits over slippery surfaces - as numerous Group A rally cars have demonstrated over the years. Are there any downsides? Is the weight distribution adversely effected by all that new hardware up front? Apparently not: the standard MGF/TF weight distribution is 40:60 with the weight bias to the rear. With the electric transmission on board, this alters to 50:50 - which appears to be absolutely neutral. No, the only disadvantage is going to be the expense and longevity of the battery pack - a problem that all petrol/diesel hybrids currently suffer from. Unfortunately, this probably means that this MG is not yet going to be available to you or I just yet. But with Rob Oldaker threatening to release the 200HPD onto the racetrack, one can only hope that the mantra that states that 'racing improves the breed' holds true, and this brilliant sports car concept is unleashed onto the wider world. 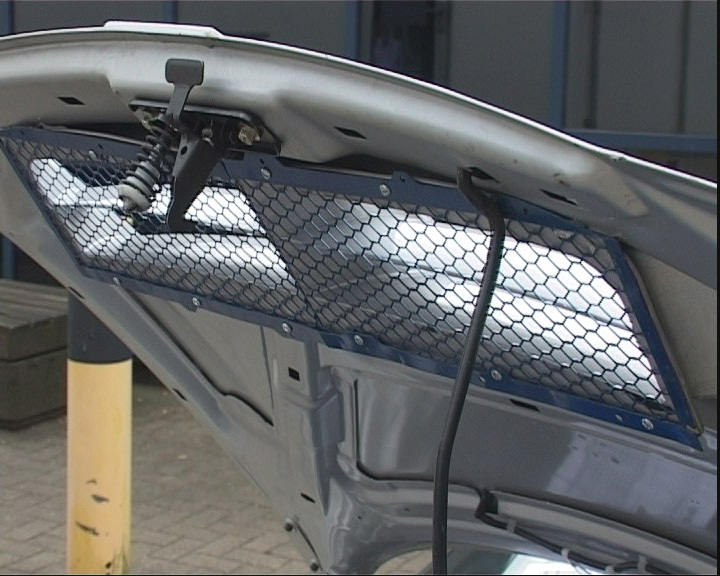 Encouragingly, MG in conjunction with MIRA Ltd and Powertrain Ltd have recently been awarded a contract by the UK Government�s Energy Saving Trust to develop these technologies into "production viable" systems for passenger cars, so there is certainly some cause for hope. More details on the MG TF 200HPD have sadly been fairly sketchy - the extent of MG Rover's press output on this car can be found in the MGF Register News section (click here). However, we are fortunate in that Tony Hall had more opportunity to look over the car in more detail - and better still, he happened to have his camera handy! In the normal MG TF, where you expect to find the spare wheel, or perhaps the "Instant mobility" kit (ha ha! ), there is a different and altogether more potent form of instant mobility that the MIRA/MG engineers have managed to shoe-horn into the available space: a 40Ps BRUSA electric motor! In the thumbnails opposite, there are four different views of this electric motor - which proves to be a surprisingly tidy installation. What can't be seen is the continuously variable automatic transmission this power unit is attached to - and the other, unique feature that makes the TF (and MGF for that matter) so ideally suited to this conversion: the hubs even on a standard car has drive splines to take a drive shaft from an engine. ...that exists through the bonnet. TF mesh grille used here. Engine inlet vents now sports scoops. Another view of the scoop. Neat rear spoiler extends the existing bootlid trailing edge. The subtle rear spoiler seen from the rear 3/4 view. With close to 200 bhp worth of power being generated, you have to be absolutely sure that the cooling system is up to the challenge. 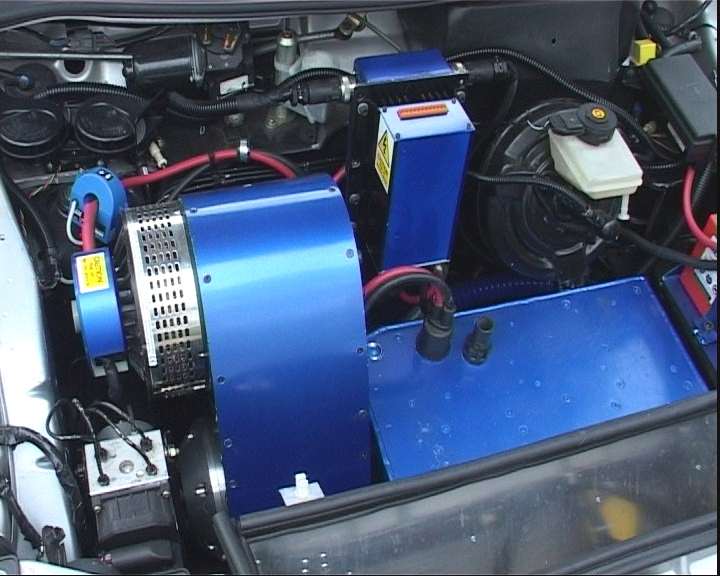 Given that the mid-mounted engine also has to generate electrical charge to feed hungry batteries for the electric motors, even when idling, means that special attention to engine bay temperatures as well as coolant temperatures needs to be taken. These areas have been thoughtfully addressed on the 200HPD, and some of these modifications can be seen in the six images opposite. Much work went into improving the aerodynamic package on the 200HPD - as mentioned above, the bonnet was remodelled to allow the venting of the radiator cooling air to pass over the upper surfaces of the car to reduce front-end lift. To balance this reduced lift at the front, the rear of the car spawned a subtle Gurney flap - a small spoiler - to help reduce rear end lift. The net combination of these two additions not only cut down lift to near zero, front and rear, but also cut the aerodynamic drag significantly, reducing the CdA figure by 7% to 3.2 compared to the standard car. Read more here. And finally, what the press photos gave no real indication of - the gadgets that this car has, and yours does not! The boot in particular has quite a lot of electrical wizardry - this is not in car entertainment of the musical variety! 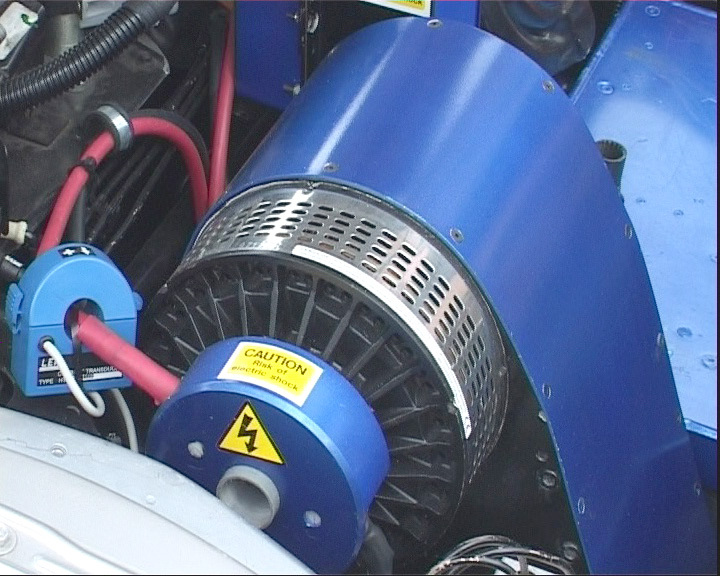 This is the Mathworks XPC vehicle management system that manages the integration of petrol motive power with the electric front drive - providing the car with it's 'city mode' automatic transmission, electric zero-emissions propulsion along with full-bore, 4WD 'hot-shift' mode where both engines are working hard, with the electric motor maintaining acceleration even during manual gear-shifts of the rear mounted 158bhp VVC engine. Cool. The second image shows the mildly altered interior - of particular interest is the charge gauge which replaces the clock, the extra blue coloured switch and the bonkers read button in place of the hazard warning switch! I don't think that the HPD has a passenger ejector seat, so what these are for your scribe has no idea! 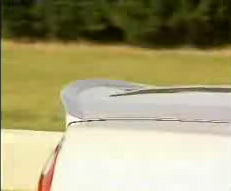 Another view of boot spoiler - a small gurney flap extension on the rear lip of the boot lid. Subtle and effective. 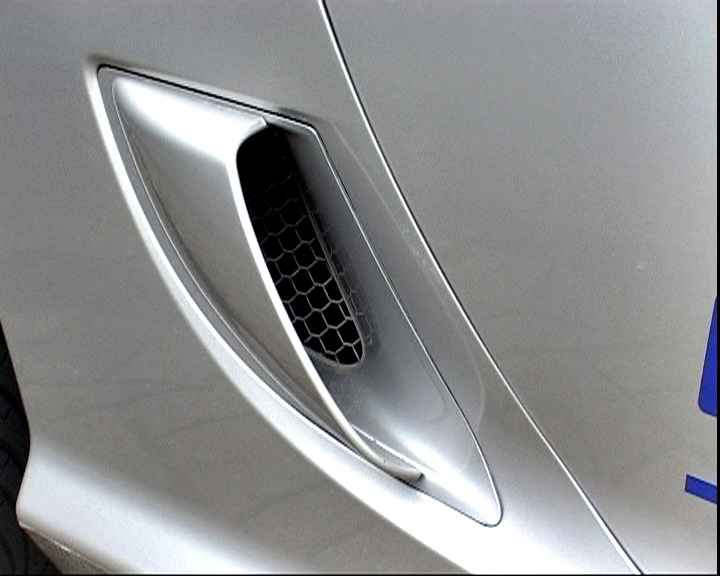 Radiator vents air up through the bonnet - rather like that seen on that other K-series powered British sports car, the Lotus Elise... ... and interestingly, the upper 'nostrill' air intakes in the nose cone have been deleted, all in the name of aerodynamic efficiency. Why choose an MGTF as the basis of a Hybrid vehicle? A sports car is not the obvious choice of platform if you are espousing the environmental benefits of a hybrid transmission system - but it is certainly a good way of getting noticed in the ever-growing hybrid vehicle crowd. Given that MG Rover are a late arrival for this particular party, getting noticed was sure to have figured highly in MG Rover's choice of donor vehicle. But the key factor is the fact that the MGTF is actually extremely well suited to such a development. 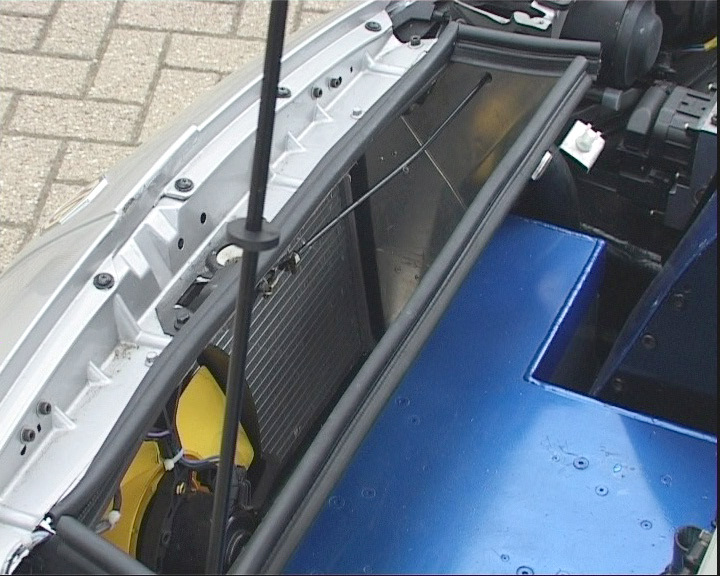 Very helpfully, the front compartment area is effectively unused space - and therefore a logical location to install an additional power plant without compromising the practicality of the vehicle or having to consider how to package a bulky electric motor into the existing engine bay. The other, less obvious reason is a by-product of using the MGF platform - a platform that was developed using Metro-derived subframes and suspension components. 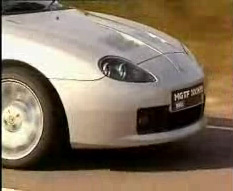 You may already know that the MGF, and now the TF, uses Metro-derived front subframes at both the front AND rear. In the rear, the subframe carries the engine and final drive - as indeed it would if it were installed in the front of the aforementioned Metro. The front subframe in the MGF/TF is purely maintained for its steering function - all engine mounts are surplus to requirement. What you may not be aware of is that the front wheel stub axles maintain the drive-shaft splines ready to accept drive shafts from an engine's final drive, but of course, this is not a feature utilised in either the MGF or TF. In a shop near you soon? 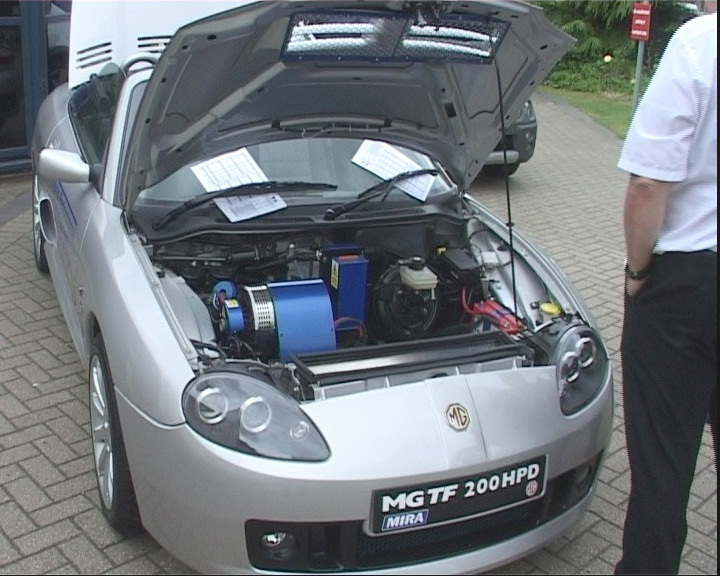 Given the availability of space for the new power train, the relatively easy engineering challenge of getting power to the front wheels and the unique sales proposition of a hybrid, high performance sports car, then really the decision to develop the MGTF into a hybrid concept was an obvious one. What's more it's all tantalisingly feasible, thanks to the serendipity of the MGTF's engineering DNA. But in reality, the answer is probably not, sadly - but there is a possibility that this car could go racing. In the MG press release, the PR guys had this to say: " MG Rover Group and MIRA expect that, once developed, the technologies will move onto the manufacturing design feasibility stage. Indeed, the partnership, which includes MG Rover Group, MIRA Ltd and Powertrain Ltd , has just been awarded a contract by HM Government's Energy Saving Trust to develop these technologies into production viable passenger cars. " Well, I guess we'll see. Following MG Rover's demise in 2005, any production future for this exciting hybrid sports car died. However, with the buy-out by NAC of China, and that company's merger with SAIC, there may yet be a future for hybrid and alternative fuel-powered MGs in the future.